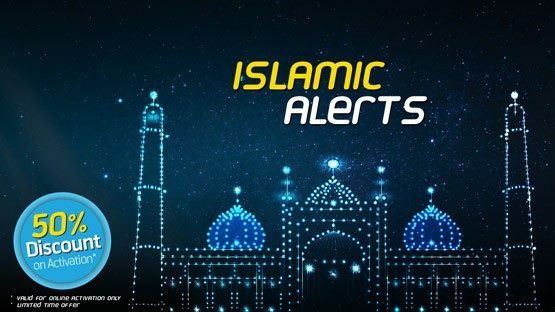 This service is available all the Djuice and Talkshawk subscribers of this network and they can get weekly or monthly service of Telenor Islamic Alert with cheap charges. This telecommunication always launches packages and services with affordable rates and subscribers easily attract for using various features of this network after getting charges of service. It is also providing cheap charges of this service and customers can activate this feature for using weekly or monthly basis with correctly. This service gives you facility for getting information of NAMAZ timing anywhere in Pakistan by using it and all the cellular operators who are using postpaid or prepaid SIMs connection of this network can easily activate this feature for using on regular routine. The complete details of this service are available as below. Customers can activate weekly service of this feature by dialing *345*786# and then press call button. Subscribers can activate monthly service of this feature by dialing *345*5*4# and then press call button. Subscribers surely receive confirmation message after activation this feature. The charges of weekly Islamic service are RS 10.00 plus tax. The charges of monthly Islamic service are RS 30.00 plus tax. Subscribers can de-activate weekly Islamic feature by dialing *345*787#. Consumers can de-activate monthly Islamic service via dialing *345*5*5#. There are no charges for de-activation these features. Subscribers get 50% discount for using on first time subscription. This service is available all the prepaid and postpaid customers of this network. All the Talkshawk and Djuice subscribers of Telenor are eligible for using this Islamic service. This network has authority for changing charges and features of this service at any time without being informed of its users. Discount will be availed only first time activation. You may also like it: Ufone HAJJ Guide Islamic Service.